Best Social Networking Site for Event Presenter! Home » Blog » Event Promotion » Best Social Networking Site for Event Presenter! We all know that social networking websites and social media marketing are the best FREE tools for promoting product and services. There are around 200 social networking websites available, but it is hardly possible for event presenters to be active on all of them. So in this blog, Yapsody will share some stats and details about social networking websites that will help you to figure out the most effective platforms for promoting your events and performances. Facebook, Twitter, LinkedIn, blogging and YouTube were the top five social media platforms used by event presenters since 2012, with Facebook leading the market. As expected, all of the other social networking websites are faded in comparison to these top five. There was a survey, where event presenters were asked to select the single most important social networking websites for their events and because only one choice was allowed, the findings are revealing. Nearly half of marketers (46%) chose Facebook as their most important platform, followed by blogging (17%), Twitter (15%) and then LinkedIn (14%). 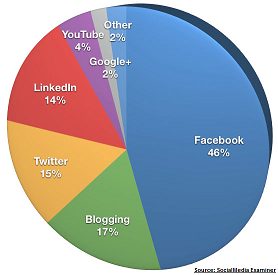 The above chart clearly mentioned that Facebook is the powerhouse platform for marketers. However, it is interesting to note the event presenters also understand the importance of blogging. So if you are planning to join social networking to promote your events, make sure you should first target Facebook, Twitter and blogs to get maximum exposure. We at Yapsody also feel that Facebook and Twitter are two basic requirements for any event presenter to promote their events and because of that Yapsody providing options to publish your events from Yapsody directly to Facebook and Twitter. This keeps your fans and followers informed about all the latest upcoming events. Customers can also book tickets from Facebook by clicking on the ticket links, which will redirect them to your Yapsody Ticket Selling System.